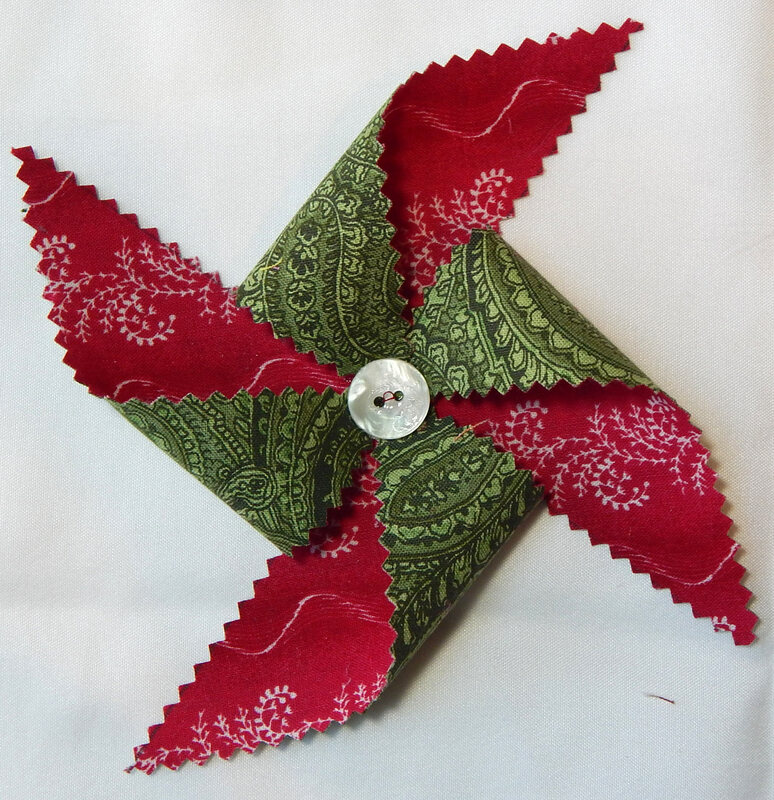 Jayne published instructions on how to make fabric pinwheels on her blog. This was just in time for me, since I needed decorations for my Christmas packages. Check out her tutorial here. Naturally, I made a few changes to her instructions 🙂 Jayne’s pinwheels were small, but I needed to decorate a big package. So I used some of my 5″ squares. 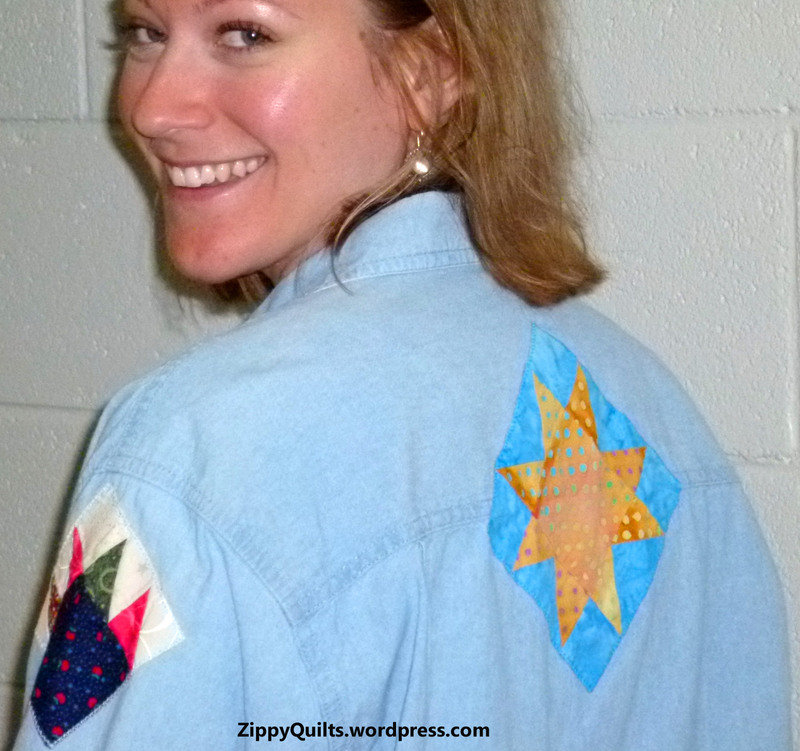 (Remember the Nickel Quilt craze? That’s how old these squares are; I was in a swap group.) 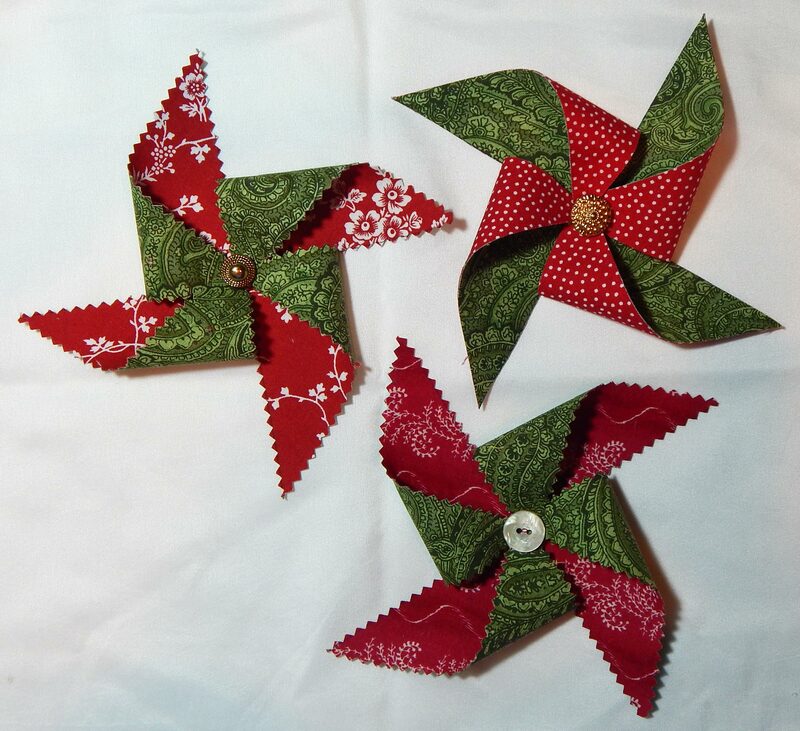 If you want to use your own 5 inch squares to make bigger pinwheels, follow Jayne’s instructions but trim them to about 4-3/4 inches after fusing the two fabrics together. 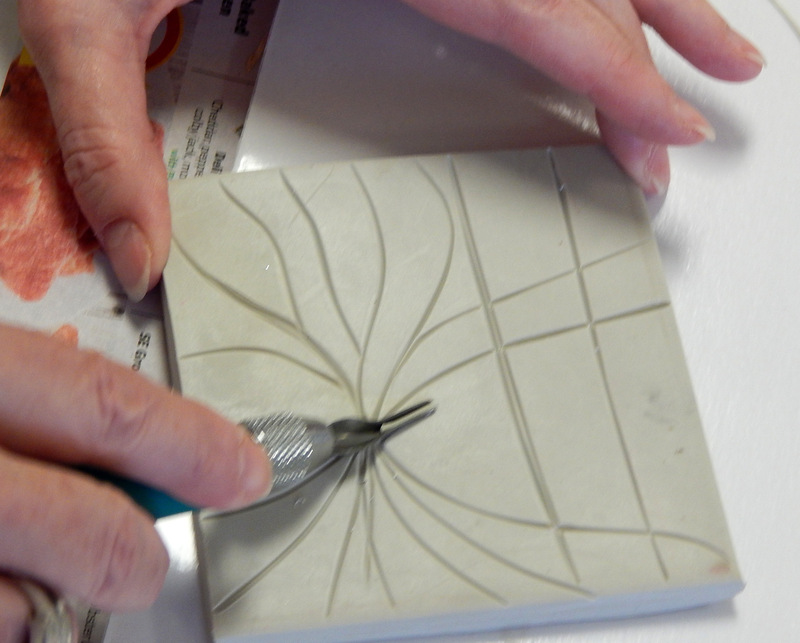 Then make your corner cuts (see her instructions) 1-1/4 inches. I just marked the center while marking for the corner cuts, so I didn’t need her measurement for the center dot. Also, Jayne used Steam-A-Seam, which is a good product, but I had Heat-n-Bond, and that worked just fine. I did try gluing the center together rather than sewing it, but I wasn’t patient enough to hold it until it dried. 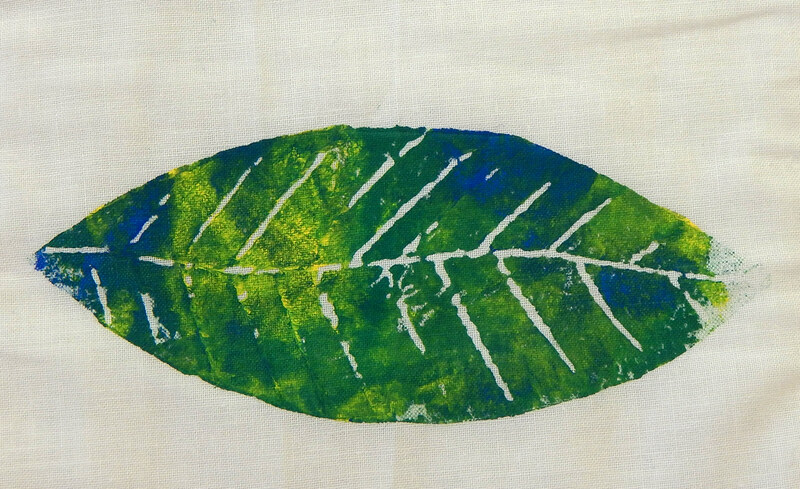 Finally, Jayne noted that “there will be fraying” since the edges are unfinished. I think that is unlikely with Heat-n-Bond; I’ve never had trouble with it. But just in case, I trimmed my edges with pinking shears rather than my rotary cutter. Remember pinking shears? Those were what we used to “clean finish” the inside seams on our garments back before everybody had a fancy machine with overlock stitch. They still work just fine if you saved yours! T shirts, too, but it’s easier to put them on a woven shirt than a knit one, so I vote for “workshirts”. Here’s an example, modeled by my friend Anna. These blocks had been around a while 😉 You know how that goes! Then I got a good deal on some chambray shirts and bought them in all the sizes my sisters-in-law wear. They made good holiday gifts! 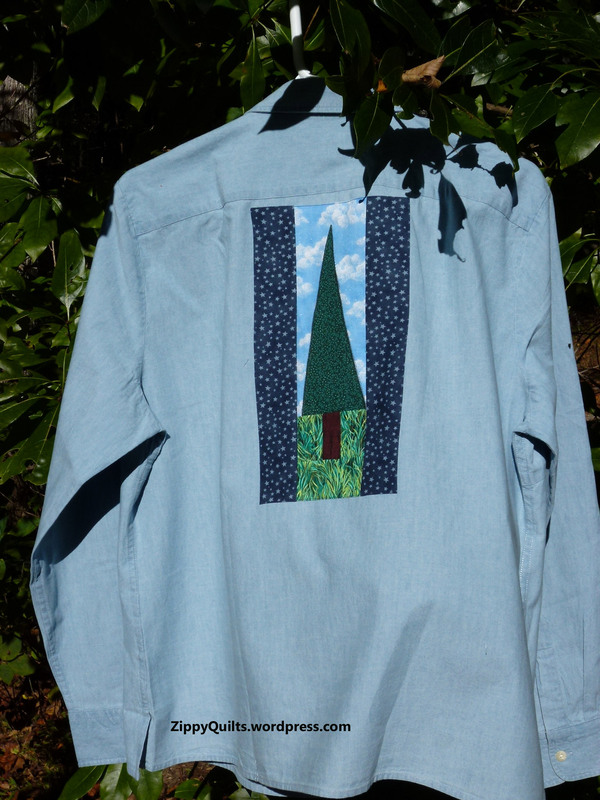 I suggest you turn under a 1/4″ hem on all sides of the block and then applique it to the shirt by hand or machine. Very easy. 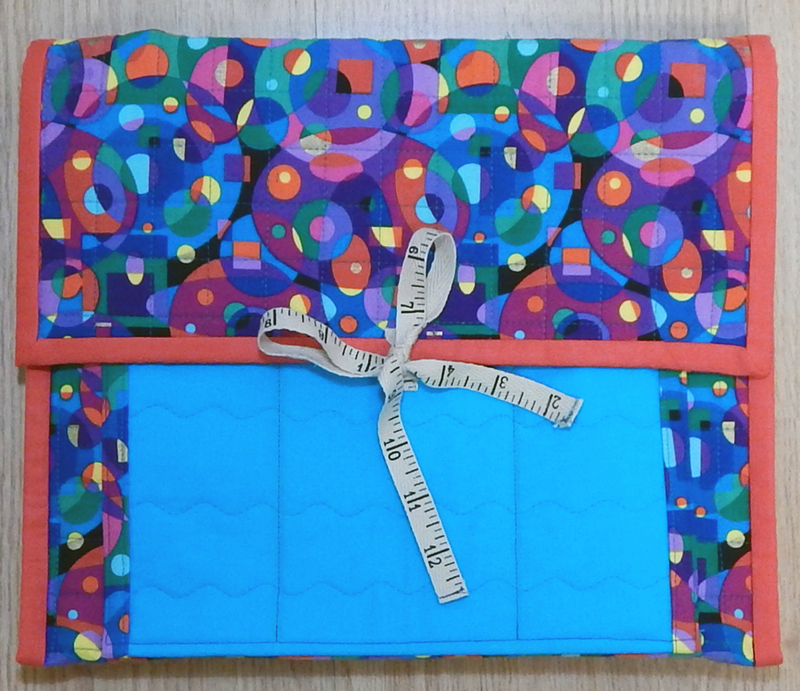 I don’t suggest quilting the block first, because even thin batting can feel uncomfortably lumpy attached to a shirt. 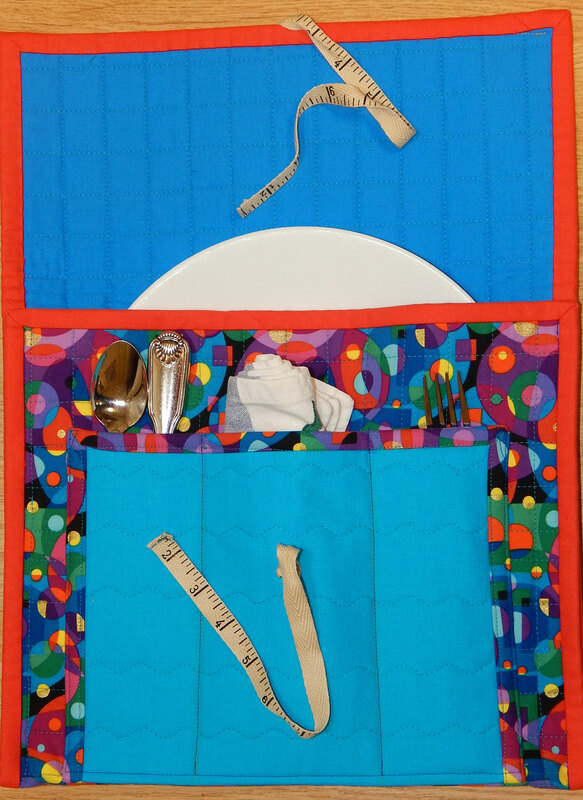 Next week: turn your orphan blocks into table runners!